Most people pack up the bike and garage them as soon as the rainy season begins. With the right gear (and attitude), that isn't necessary. 45.717112, -121.614142. Hwy 14, On the bank of the Columbia river. We've been lucky enough in the Pacific Northwest that fall hasn't kicked in too hard for most of October. It's been a bit colder, but not too much rain. That definitely changed drastically a few days ago. I woke up in the motorhome after listening to the popping sound of very heavy rain on the RV roof. The dog would look around the room and at the ceiling, trying to figure out what was going on. Instead of being upset about the weather, I remembered how much I appreciate this time of year for riding. No bright sun, no sweating, no dust. The colors pop, especially the greens and yellows, and have enough contrast to make for great views. My favorite part, however, is the clouds and fog hanging in the evergreens like a blanket. There's nothing more PNW than that. Planning ahead this summer, I made sure I had gear that was ready to tackle this wet season. There was no way I was going to sit out a winter and not ride my motorbike. It hadn't been wet for a while, so I hadn't had a real chance to test it out. I decided today was the day to go out and see how comfortable or miserable I could be, and whether or not my supplies would survive. For this adventure, I opted for a standard dual sport setup. Keeping it simple, yet having the essentials, is the heart of dual sport preparation. 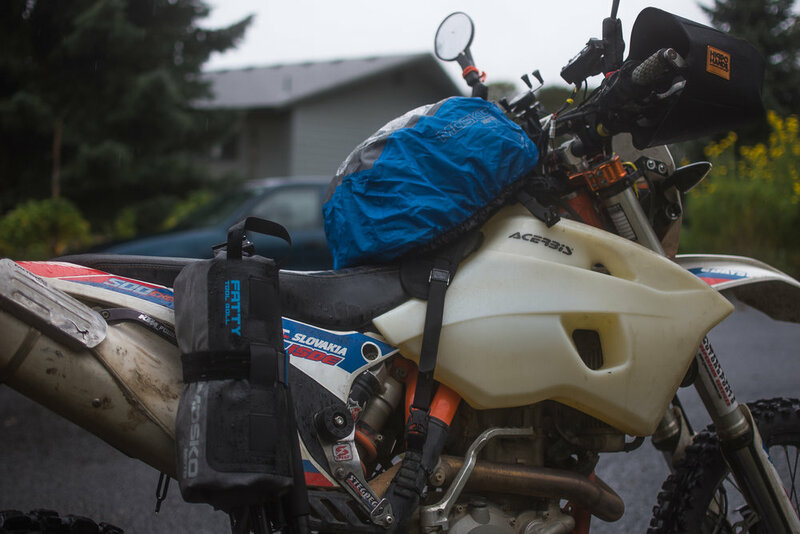 Tank bag and tool pouch is all you need, as long as you do it right. 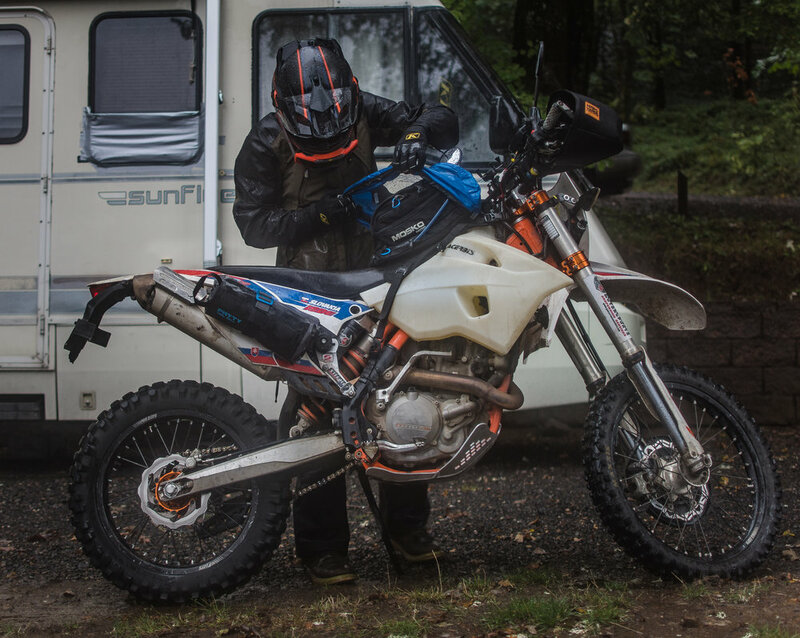 It's about finding the perfect balance between dirt biking from the back of the truck and a full on adventure. I slid my Mosko Moto Fatty Tool Roll inside of it's waterproof pouch, rolled it up, and strapped it to my grab handle. This differs from most tool pouches, since it actually comes with a superior quality watertight solution. I can leave it outside the bike, without worrying about my tools rusting, or shoving it in some sort of drybag. 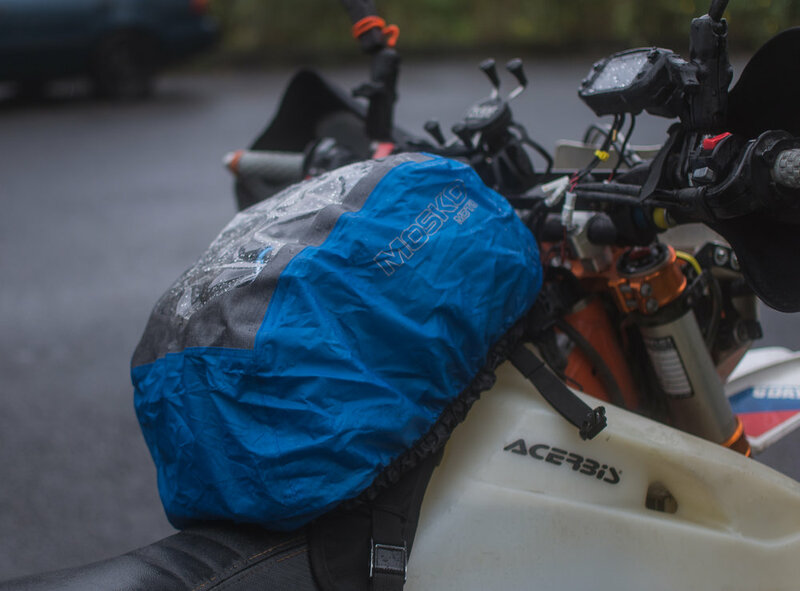 The Mosko Moto Nomad Tank Bag went in it's usual spot, but I deployed the rain cover immediately and cinched it in place. It's pretty much a rain jacket for the tank bag, even though the bag itself is made of thick material, which would actually take a long time to saturate and get wet on the inside itself. I trust this setup enough that I kept my DSLR, batteries, air pump, stack of decals to share, etc inside of it on a day like this. As for outerwear, I recently picked up a KLiM Traverse suit. I needed something waterproof enough for the winter, without the bulk and constriction of the Badlands setup. The Traverse, in my opinion, is basically a stripped-down version of the Badlands. Layering and having separate armor from the jacket and pants is important to me, as well as it being loose and lightweight for the off road sections. Getting wet on a ride is your worst enemy. I made sure that every part of my body was prepared for this ride. I knew that it was going to be so wet that I was going to feel like I was riding through a hurricane on the freeway (especially behind cars). Starting with my feet, I use the MSR Dual Sport Boot. These were designed to be fully waterproof, but after a year and a half of use, they fail in that department. I was able to compensate for that by using the discontinued KLiM Covert Sock, a Gore-Tex sleeve for your feet. For the legs, I wore the KLiM 3.0 base layer pants, covered by my knee guards and tech shorts. Of course, I had the Traverse pant over that. The torso was the same idea. Pressure suit armor, 3.0 base layer, Traverse jacket. Helmet and goggle setup doesn't really change this time of year, it's basically all the same. I supplemented my Krios/Radius setup with a balaclava, though, which made a world of difference keeping wind and rain off of my neck. I felt warm, dry, and comfortable enough, it was like I was wearing dual sport pajamas all day. Gassing up in Carson, WA. A tool roll big enough to contain a spare tube. I set out with no plan nor direction. I ended up following Hwy 14 west until I hit the Bridge of the Gods. The rain was coming down extremely heavy at this point. Since there was so many hanging clouds, there was no way to un-fog my goggles. I was almost riding blind. 45.661741, -121.898484. Bridge of the Gods, Oregon side. After a very miserable and seemingly unending ride down the 84 east, getting blasted by water spray of cars in front and next to me and not seeing a damn thing through my goggles, I finally arrived in Hood River. Quick pub stop for lunch. After the pit stop, it was a short trip across the bridge to stop at the Mosko Moto shop. I spent this entire ride in just regular moto gloves. These Hippo Hands made that possible, blocking all wind a rain from touching my hands, and keeping them warm by avoiding all wind chill. Once I felt I had tortured myself enough on this 60 mile loop in the heaviest rain I'd been in for many, many months, I took off back to the RV. Although, I couldn't help but stop and grab a shot of one of the many tunnels along that highway. I made it home warm and dry still, and all gear intact. Don't park that dual sport this winter, get out and enjoy the wet season. A Day at the "Office"